The Battle of the Saxes tour is one of the innovative and most exciting projects to emanate from South Africa in the past 20 years. This unique project features classical saxophone, jazz saxophone, jazz rhythm section and string quartet performing repertoire comprising primarily South African compositions (classical and jazz). A unique feature of this project is the premier of a new work by legendary South African composer Noel Stockton who wrote a four movement work entitled Holiday for Saxes that features the both classical and jazz saxophone with string quartet and rhythm section. This highly energetic work pays respect to both jazz and classical styles while lending itself to uniquely South African influences. Stockton is clearly one of South Africa’s pre-eminent composers capable of composing in both jazz and classical styles. In this innovative work he is able fuse both styles in fresh and inspiring manner that will keep audiences enthused for the duration of the four movements. The balance of the repertoire features uniquely South African compositions including but not limited to African Beer and Amampondo Suite by William Haubrich for saxophone and strings and historically significant jazz compositions such as Cape Town and The Wedding by Abdullah Ibrahim. One of the goals of this project is to highlight the outstanding South African compositions in a new and entirely different way. Accordingly this tour will include primarily South African compositions/arrangements in both the jazz and classical idioms. The Battle of the Saxes tour will include two of South Africa’s pre-eminent saxophonists: classical saxophonist Matthew Lombard and jazz saxophonist Karendra Devroop. Matthew Lombard is one of only a few classically trained saxophonists in South Africa, and actively performs and teaches nationally. 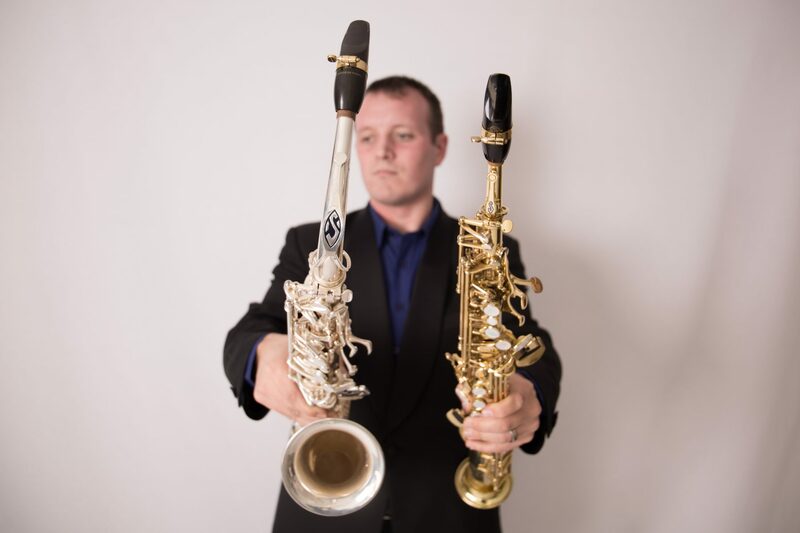 Matthew recently returned from completing his post-graduate studies in the UK at the Royal Northern College of Music, where he studied with world-renowned tutors of saxophone, including Rob Buckland, Andy Scott, Carl Raven and Vincent David. Matthew has been awarded prizes from national music competitions including the UNISA Overseas Scholarship Competition, the UNISA National Wind Competition, the SAMRO Overseas Scholarship Competition, and the ATKV Muziq National Music competition. Matthew actively commissions new works from South African composers through SAMRO, and is an active promoter of this music in South Africa. As a performer, Matthew has a passion for South African music, and endeavors to introduce audiences to this music as often as possible. It is to this end that The Battle of the Saxes Tour will feature primarily South African works. Matthew is full-time saxophone teacher at Pretoria Boys High School, and is the saxophone lecturer at the University of Pretoria. In addition to these roles, Matthew is in high demand as an educator, and presents master classes and teaches part-time at other prestigious schools around Pretoria, including Cornwall Hill College and Waterkloof House Preparatory School. Matthew also founded the UP Saxophone Ensemble in 2015. As a performer, Matthew has appeared as soloist with the KwaZulu-Natal Philharmonic Orchestra, the Chamber Orchestra of South Africa, the University of Pretoria Symphony Orchestra, and will be making appearances with orchestras in Gauteng during 2015 and 2016 including the Rand Symphony Orchestra. Karendra Devroop is a nationally renowned jazz saxophone player with a growing international profile. He has performed extensively across South Africa with some of the country’s leading jazz musicians including Melvin Peters, Marc Duby, Feya Faku, Zim Nqawana, Bokani Dyer, Andre Peterson, Kevin Gibson and Shaun Johannes. He has performed at most major jazz venues across the country in all major cities. Internationally he has performed across the US (highlight festivals include Gretna Jazz Festival, North Texas Jazz Festival, Virginia Arts Festival and Beachstreet USA), Netherlands (2013 Amersfoort Jazz Festival), Thailand (2013 Samui Latin and Jazz Festival) and Taipei International Music Expo. He recently performed alongside Dr Lonnie Liston Smith with the international saxophone summit that included Alexander Beets (Netherlands), Koh Mr Saxman (Thailand) and Ben van de Dungen (Belgium). He has performed as a side stage act to Earth Wind and Fire, Chicago, Queen Latifah and Jill Scott). He has several live and studio recordings to his credit including his debut solo CD recording “Reminiscing” which received airplay in over 30 countries on all continents. Track 4 peaked at no 4 on the Jazz Charts in Spain before retreating. Devroop and Lombard established the very first Unisa National Saxophone Symposium in 2014. This landmark event included internationally recognised artists such as the Apollo Saxophone Quartet (classical – UK) and Artvark Saxophone Quartet (jazz – Netherlands) and a host of South Africa’s best classical and jazz saxophonists. The symposium included clinics, workshops, master-classes and recitals for students across the country and led to the revitalisation of saxophone performance nationally. Additional musicians on the Battle of the Saxes tour include a rhythm section comprised of Roland Moses (jazz piano), Viwe Mkizwana (bass) and Dio Santos (drum kit) and the nationally recognised string quartet – the Evolution of 4 String Quartet (Johanna Roos, Ane van Staden, Valery Andreev and Jessica Bailey). This tour has been generously supported by the Nedbank Arts and Culture Trust, as well as the Concerts SA Mobility Fund.